Radioactive nuclear waste is the deadliest substance on earth. It is invisible: you can neither smell nor taste it, and one curie of it will kill. No one knows how much there is, or even where all of it is stored. But every year there is more and more, and no one knows what to do with it. 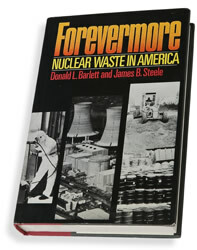 This is but one conclusion drawn in this superbly researched, compelling account of the forty-year failure to grapple with the deadly radioactive waste accumulating around us. By law, the government must choose a site for high-level waste storage and a number of low-level dumps as well. Since no state wants these dumps, politicians are playing a game of radioactive musical chairs, each seeking to exempt their constituents from waste sites, through special deals struck in Washington. Even so, no state is totally free from danger. Marshalling a wealth of new information from once-secret government reports, internal documents, private correspondence, and interviews, two Pulitzer Prize-winning reporters have provided a powerful stimulus for all Americans. We must rethink this problem sure to haunt us for generations — indeed, forevermore.